Apples of Gold presents a solitaire gemstone ring with truly sparkling personality. A green amethyst gemstone takes center stage in this lovely piece with its lightly-colored look and undeniable shine. The gemstone is round cut for elevated brilliance and measures 6mm, 7mm or 8mm for just the right size. Resting in a four-prong setting, the green amethyst is perfectly poised to give a shining performance. 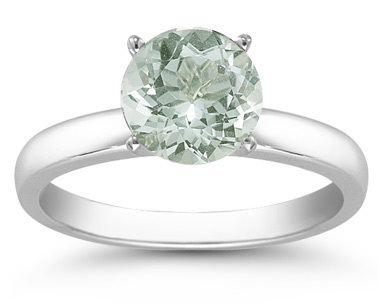 The clean band of silver makes for a radiant foundation without overpowering the beautiful green amethyst gemstone. We guarantee our Green Amethyst Solitaire Ring in Sterling Silver to be high quality, authentic jewelry, as described above.